Stackable diamond rings are a super hot trend. 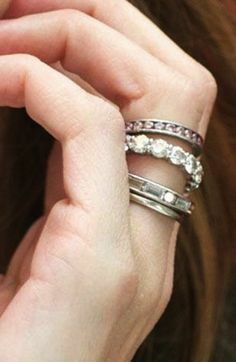 If you dont have a stackable diamond ring and I mean ALOT of them you need to showpnow! Stackable dimaond rings are affordable, our most popular one is $100 so price is not a concern. We offer our stackable diamonds rings in white gold, rose gold, and yellow gold. The best are the really thin ones that measure approx 1.1mm so you can stack 3-5mm depending if you have a longer finger. These are just some of the celebrities sporting stackable flash diamond rings. Stackable diamond rings can be worn on the engagement ring finger or left hand. Its a nice break to sport a channel set stackable diamond ring mixed with a bezel set diamond eternity ring. Mixing different diamond rings give you a lot of wardrobe flexibility. Another great stackable look is mixing a larger diamond eternity ring approx 3-4.00ct with a delicate dainty stackable diamond ring. The contrast in sizes looks stunning! Vintage stackable diamond rings have also become popular. VIntage designs generally have milgrain and filigree accents that border the diamonds. We specialize in rose gold and white diamond stackable vintage antique eternity rings. These are our top sellers. Have fun and mix and match to give you everyday flexibility. This entry was posted in Bridal Depot, Jewelry News, Jewelry Trends and tagged antique diamond ring, bezel diamond eternity, black diamond rings, blue diamond halo, blue diamond ring, blue dimaond rings, diamond eternity ring, diamond rings, gold diamond eternity band, pave blue diamond ring, rose gold diamond eternity, stackable black diamond, stackable blue diamond, stackable diamond ring, stackable eternity band, vintage diamond eternity, vintage stackable ring, womens eternity ring, womens stackable bands on April 27, 2014 by blog1039.